To describe Amon Tobin's music is tricky. To describe his live show at Brooklyn Masonic Temple last night is impossible! So I will attempt to to do the impossible and put into words what I experienced in the heart of Brooklyn for a wonderful few hours last evening. Anticipation was high as his 3 night residency at the Masonic Temple had sold out weeks in advance. 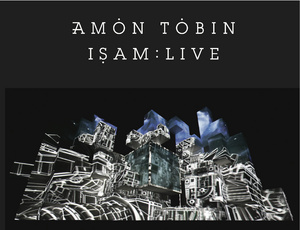 I had heard about Amon through a friend and then saw a video on The Creator's Project about the construction of his latest live show ISAM. I was to put it mildly, intrigued. A wonderful simply staged set by Emika kicked off the evening as people filed in. I had not heard her before and really enjoyed her musical stylings with haunting vocals and some heavy bass. It was the perfect introduction for what was to come. I had also seen some preview vids on youtube for the ISAM so I knew a little of what to expect but was still unprepared for the aural and visual assault that was to come. Holy cow.... this event blew me away. Space ships, alien landscapes, deep space, machines - all transposed and played out in perfect synchronicity with the music - I felt transported. Literally at several times during the show, I felt as if I was moving or the 3D cube object was changing as well. Insane! If you listened to his music while watching paint drying you could not fail to be impressed. If you watched the visual display while listening to a washing machine run the spin cycle, you would be likewise impressed. Together it was a audio/visual masterpiece the like of which you rarely see on a stage anywhere. At the end of his third encore, he jumped off the stage into the crowd and walked out the main door with the rest of us...a craftsman finished his work! Tobin is known as an innovator musically and his live shows prove that. It's hard to imagine what could come next from him after ISAM as stunning as this was but I wait with bated breath. Vids are up on http://www.youtube.com/clubbersguidenewyork. If you hear lots of "wow's or 'ahs' in the soundtrack - its just me!